One of our most important goals on the Ballistic Racers Flyball Team, is to give back to the community. 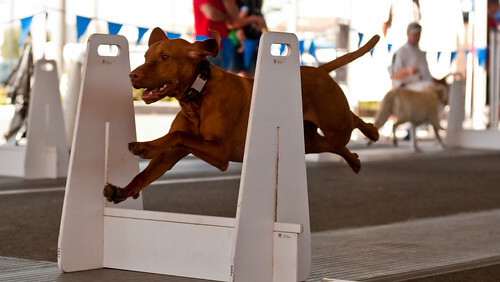 We feel it is something which we must do in order to keep up the sport of flyball. During the Holiday Season we keep up the spirit by donating a basket of dog gifts to a worthy rescue group. 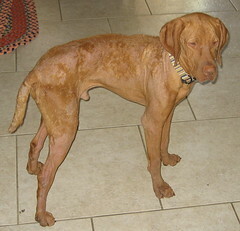 This year we have chosen SoCal Vizsla Rescue since we have acquired Dennis the Vizsla on our team. 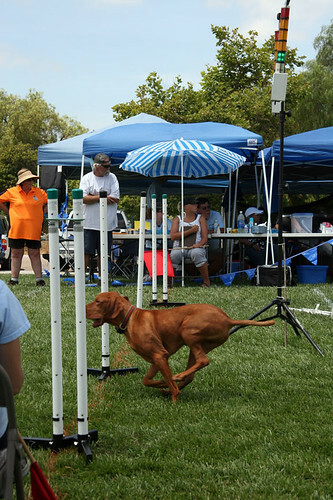 Dennis and his owner Kelly, have done an exceptional job learning flyball and improving their flyball skills. Dennis started a little more than a year ago, had his first team race in January at Irvine, and has already accumulated 3 titles. Not bad for a rescue who was found wandering in a canyon in Lake Elsinore. 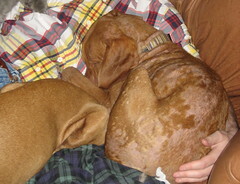 We are currently collecting items for Vizsla Rescue like dog blankets, toys, treats, etc. If you have an item which we could include in the basket, we would be happy to pick it up as long as it is in San Diego. If you are out of town, you can send a monetary gift or a toy by mail. 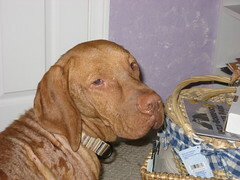 We will make sure Vizsla Rescue receives all the goodies they deserve and more. Thanks for your support. Those old pictures of Dennis always make me sad … poor little guy. He’s so much happier now!